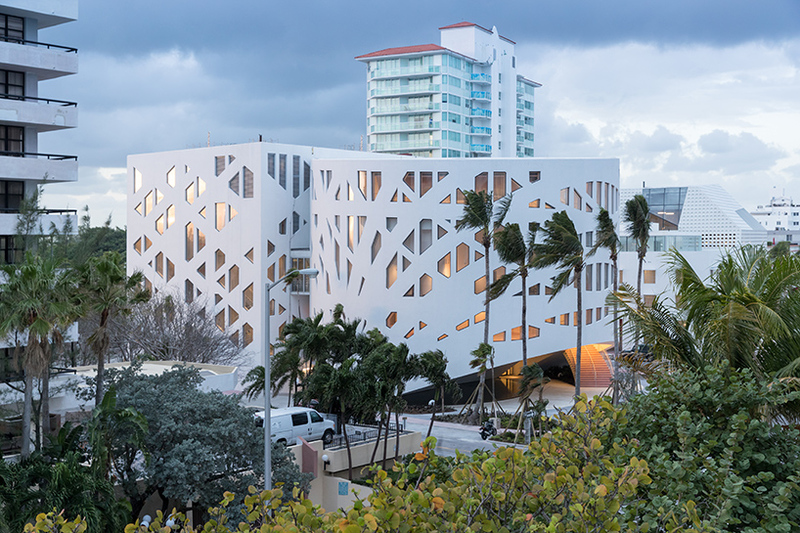 OMA has completed the faena forum, a miami beach venue dedicated to the development of cultural programming in the region. 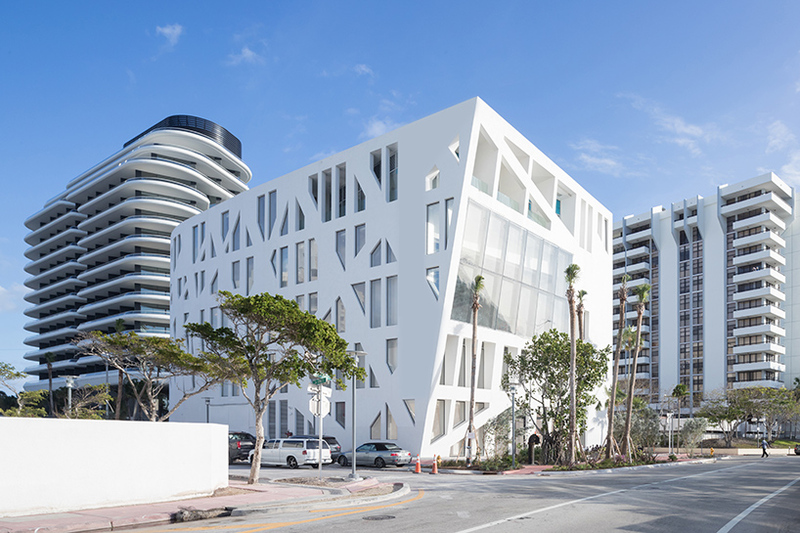 the building forms part of the faena district, a neighborhood which includes two further structures designed by the international firm: faena bazaar, a venue for curated retail and events; and faena park, a state-of-the-art parking garage. all three structures are connected through a sequence of public areas, including an entry plaza on collins avenue and an open courtyard within the bazaar. 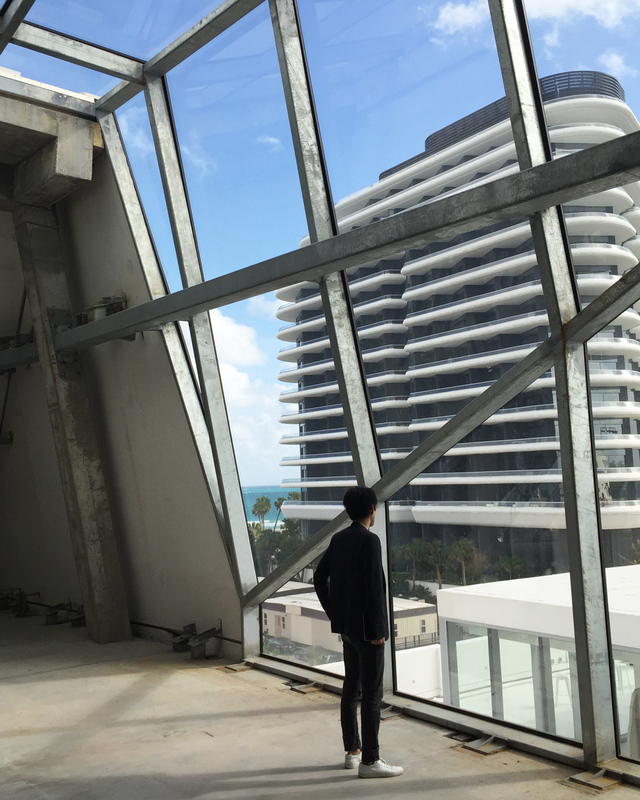 during miami art week, designboom took a private tour of the district with OMA partner shohei shigematsu to understand more about the beachfront complex. read our interview with the architect below. 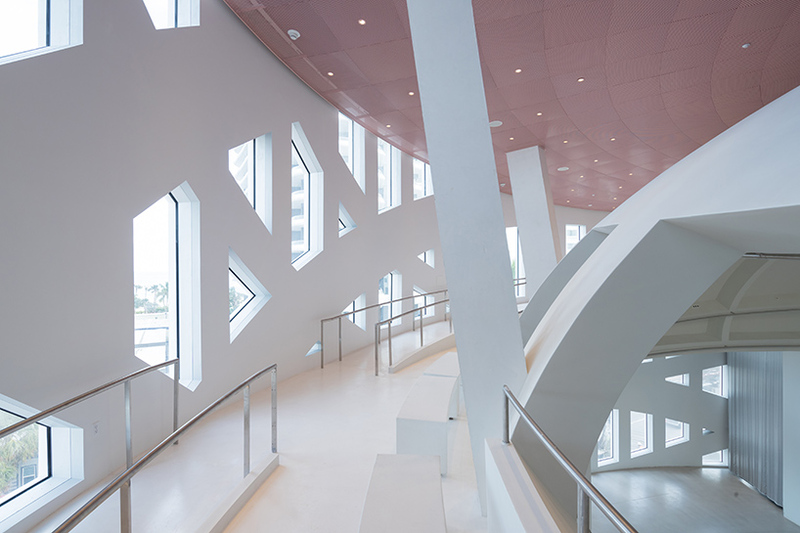 the forum, the centerpiece of faena’s development, has been designed by OMA as a series of large flexible spaces that can accommodate a range of events — from culinary pop-ups to concerts and exhibitions. the building comprises two similarly sized volumes, a cylinder and a cube that can be combined or subdivided to support potential productions. from the exterior plaza along collins avenue, visitors are met with a 46-foot cantilever and reflecting pool. this cantilever is supported by a structural concrete façade that forms a series of arches and curves. the façade, which contains a total of 350 windows, allows for vast column-free spaces internally on the building’s two main levels. 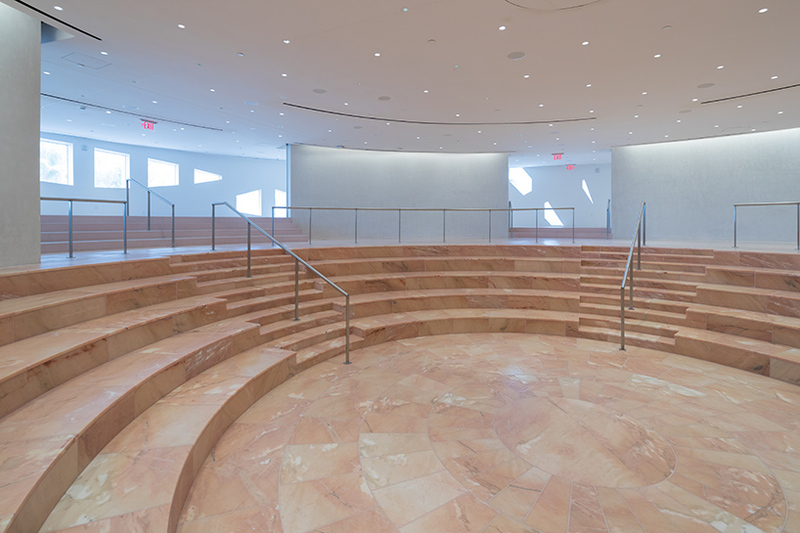 an amphitheater at lobby level includes pink marble floors, while the upper floor assembly hall features a 40-foot-high dome complete with a glazed oculus. 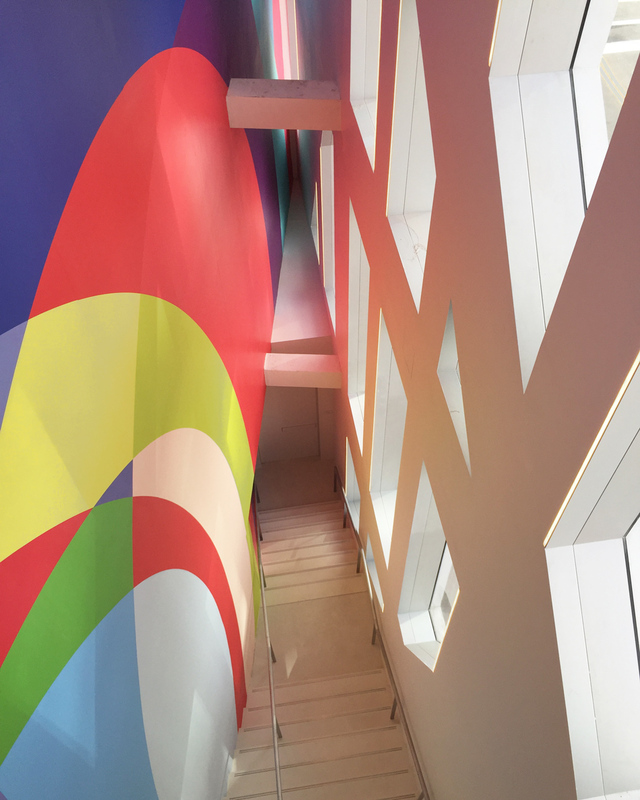 a walkway spirals up the interior wall of the forum from street level, providing visitors with a range of perspectives on the space as well as additional seating. faena bazaar is the renovation of the historic atlantic beach hotel, originally constructed in 1939. in addition to preserving the building’s original façade details and lobby entrance, OMA created a central courtyard that is unified by privacy screen and a penthouse terrace with views towards the atlantic ocean. set to open in march 2017, the bazaar will provide curated ground floor retail outlets and event space. 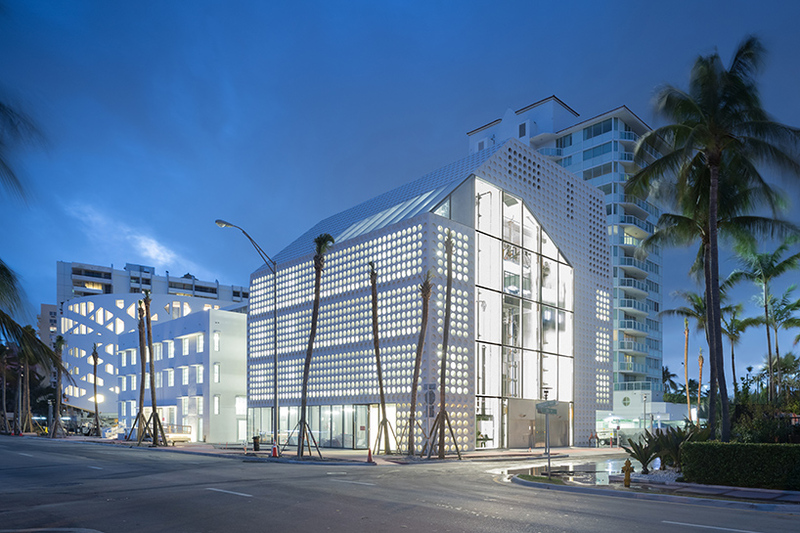 the third venue is faena park, a structure with a capacity for 81 parked cars, as well as retail spaces at its street and uppermost level. the 28,000 square foot building uses a mechanical system that stacks cars 2 per space for maximum efficiency. 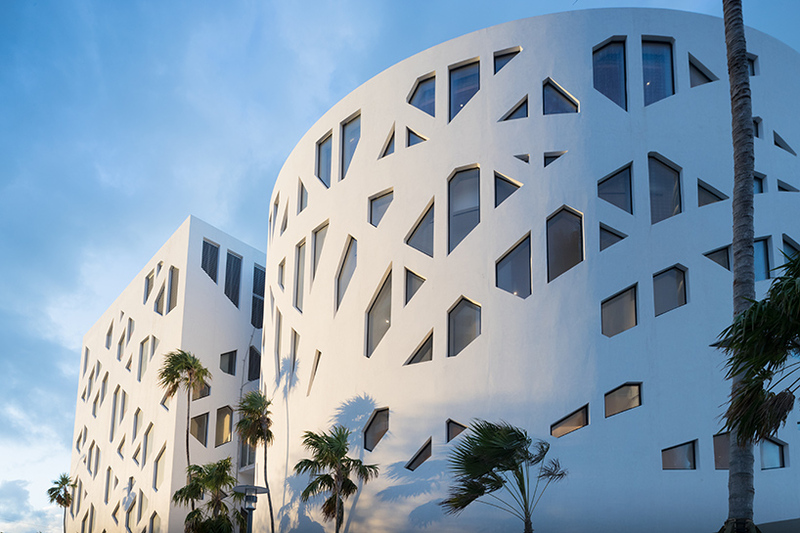 the precast concrete façade features angled perforations that allow for ventilation and controlled views. a subterranean level connects all three buildings, providing space for an additional 154 cars. designboom (DB): can you start by telling us how the project came about? 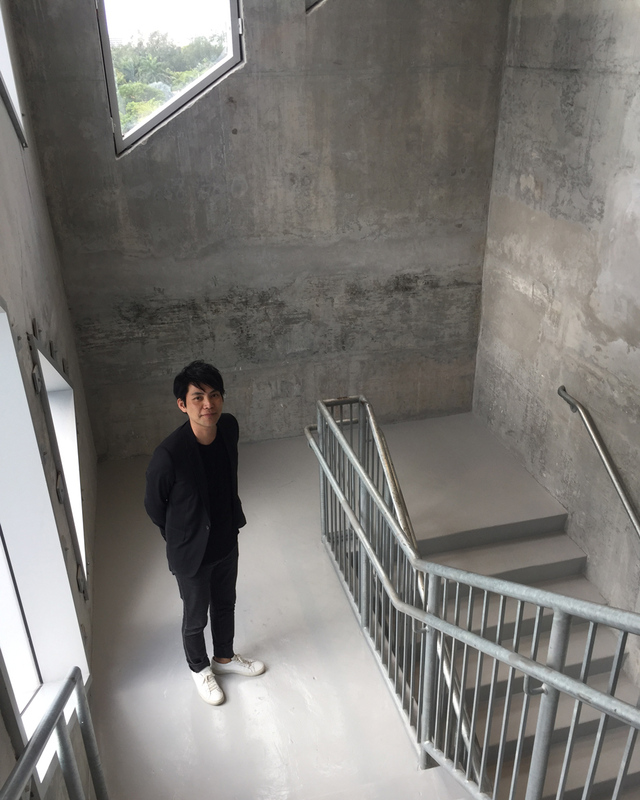 shohei shigematsu (SS): we were first going to do a project in buenos aires (with faena), but as the economy was unstable they came here to the middle of miami beach. it is not a bad location, but when we first came it wasn’t really a vibrant area. 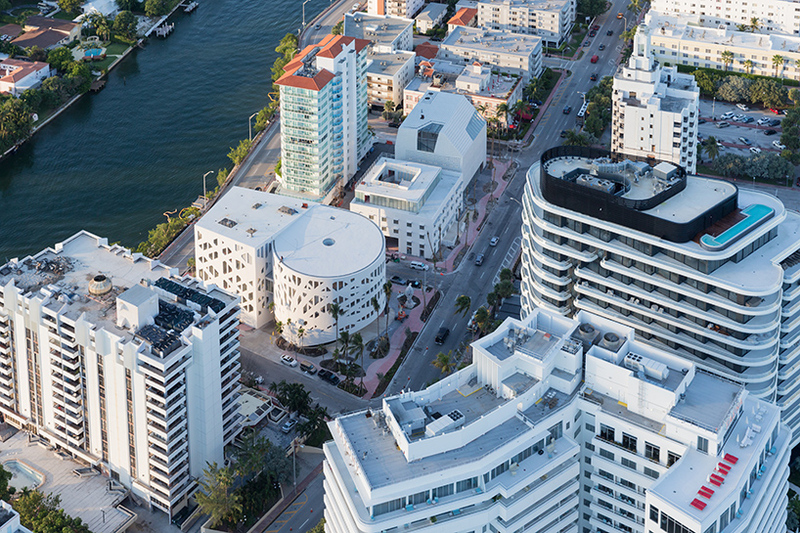 one of the methods that faena brought was to create a neighborhood as opposed to a huge compound. 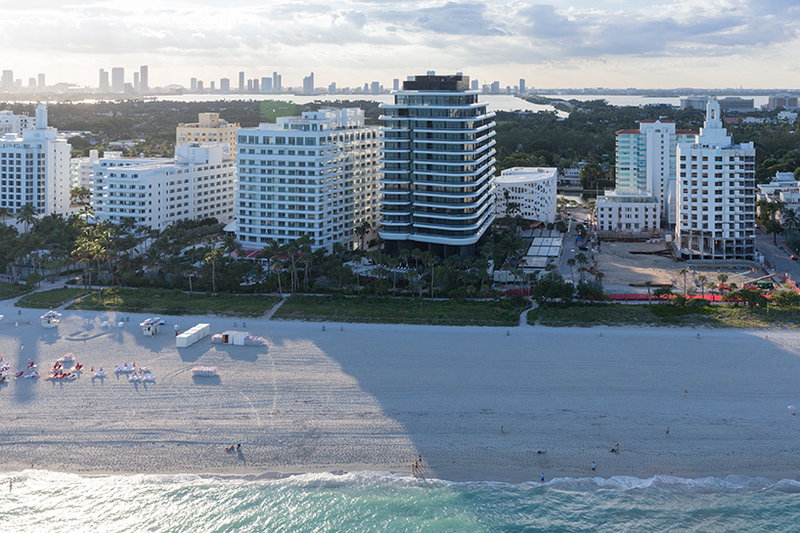 DB: how does the scheme respond to this miami beach setting? 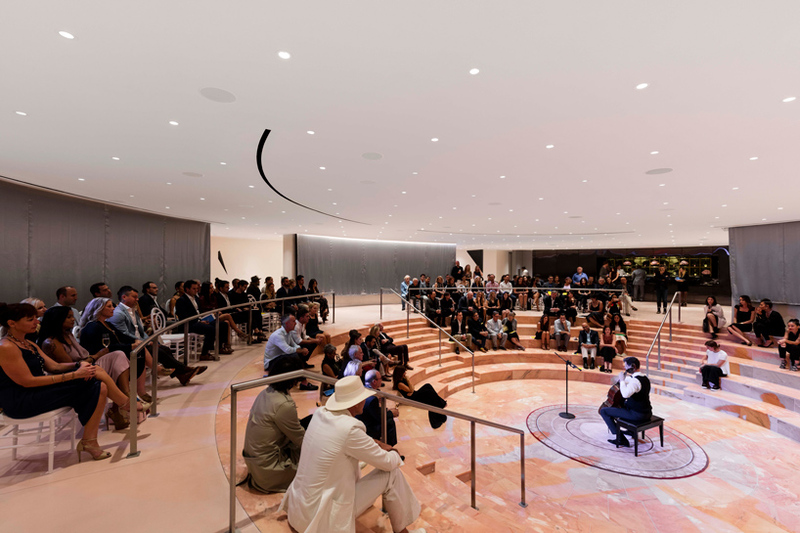 SS: as miami is changing from a resort city to a real cultural destination, I think it is a natural evolution that really caters to people visiting the city. 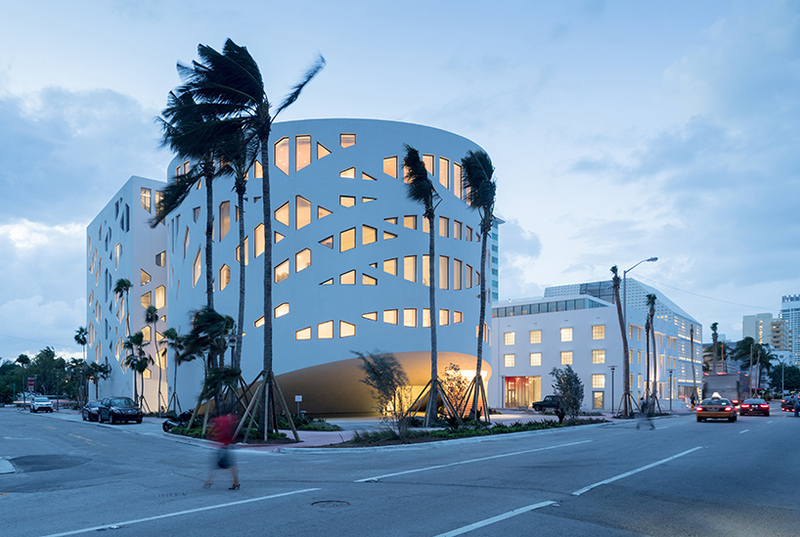 alan faena’s approach of creating different buildings encourages people to go out and walk, or at least cross the street. it is very walkable. that informed the design solutions to some degree. DB: can you give us an overview of the project? SS: we have three sites: one was a big wedge shape, one was the protected atlantic beach hotel, and one was an empty lot that we developed as a new building. rather than conceiving one big volume and two smaller volumes, we thought maybe we could design more equal volumes to enhance a sense of neighborhood. 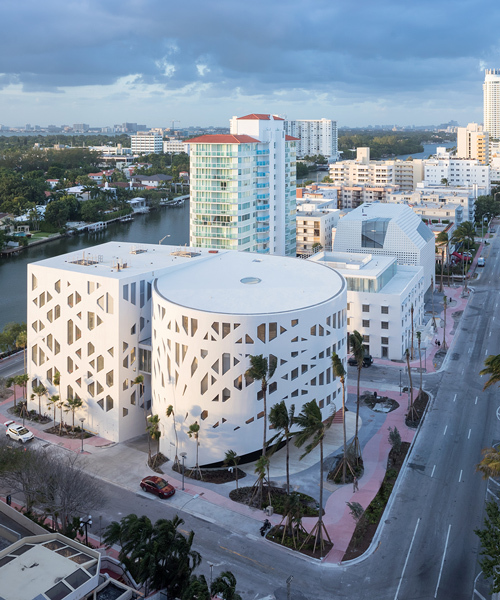 we wanted to make the faena forum a rounded shape so that it almost looks like the center of the district. it also creates a much larger public domain around it, because if you build close to the property line you only leave the sidewalk. 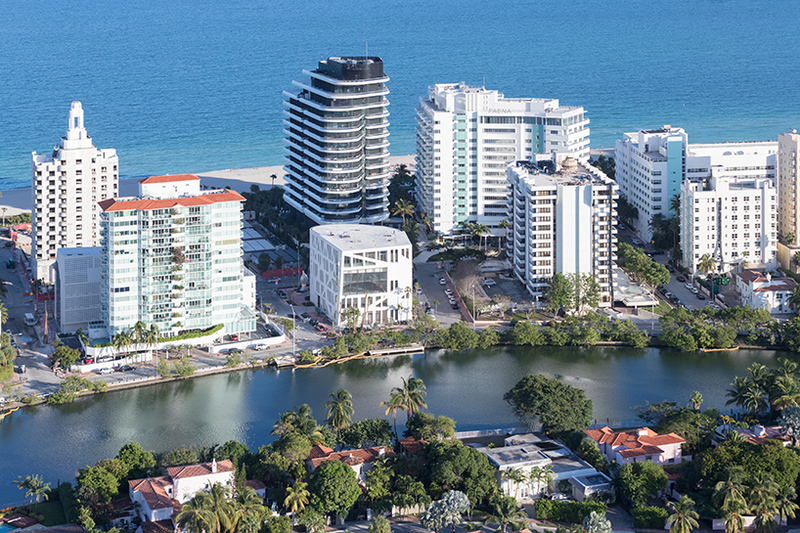 the round shape also has some resonance with the modernist art deco language of miami beach. SS (continued): as it was built in a residential area, it made our building somewhat intimate, but grand like the guggenheim. the guggenheim originally wanted to build a much bigger building in central park. they were pushed to the upper east side, so they had to make it smaller. but it created a really magical scale, a jewel-like scale. for our building, there was a height limit, there was a sensitivity with the residents… so these similar restrictions made it less grandiose. SS (continued): the forum’s two volumes are well known, a cube and a cylinder. but together we thought we could propose something interesting. in the end, this is a very multi-functional building. normally, if you really push for multi-functionality it ends up becoming boxy with no character, but the shape was conceived through our urban analysis. also, spending a lot of time in buenos aires informed us that faena really loved this classical form. it is a juxtaposition of classic versus very contemporary. DB: how were you able to cantilever the outdoor canopy at ground level? SS: it is about a 50 foot cantilever. there are spaces above, but it is all cantilevered with no columns. in order to do that we had to use the façade as the structure, so this is basically a façade pattern that is all structural. you can see the series of arches that are supporting this cantilever. we like this pattern because it looks like a seashell or a palm tree, an organic form that is appropriate for miami. DB: what are the characteristics of the two main spaces: the amphitheater at lobby level and the upper floor assembly hall? SS: the (assembly hall) is within a structural dome where you have all the infrastructure possible, so it is not just decoration like the pantheon — you can see the speakers and the various projections mounted onto the dome. 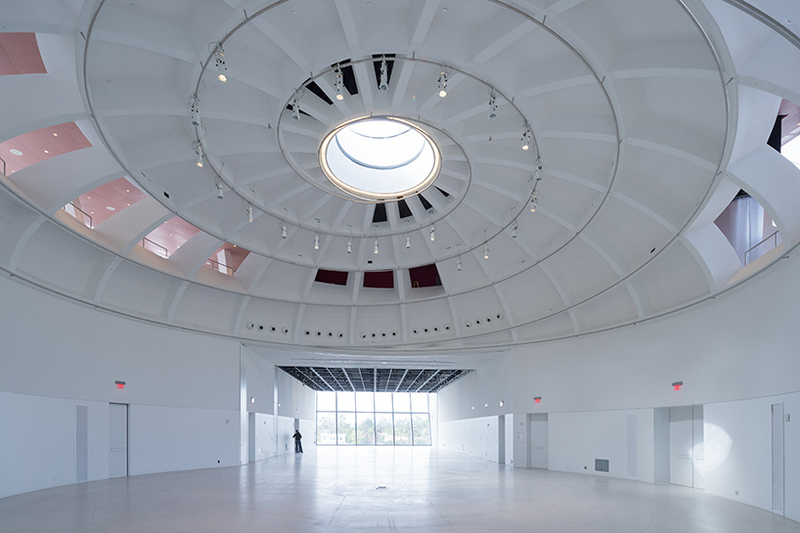 then, at the center you have the oculus, which can be closed to control daylight. from above there is a balcony where you can look down. the wall can be closed so you can have two simultaneous events, or one big event. obviously, if you are having simultaneous events — one in the rotunda and one in the black box — you need two different entrances. it has a sense of grandness, but it is not too big or too small. SS (continued): we conceived the amphitheater as a reverse of the dome — almost like a bowl. 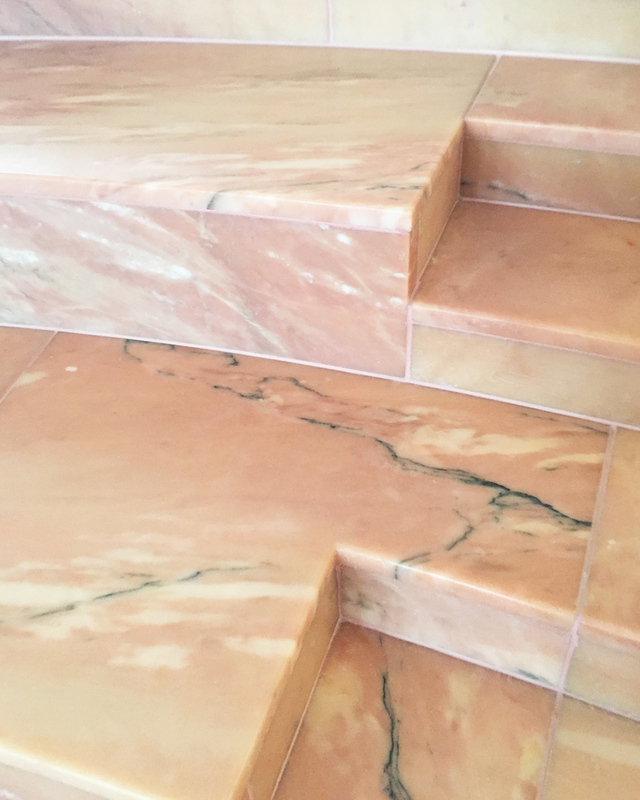 we wanted it to look like a natural amphitheater so we used this pink marble. this is where you can have events, and they already held a cello concert. there is also an acoustic curtain that can deal with the different types of events. the scenography design is this huge disc where people can sit in the pit and be very close. we also calculated today’s sunpath — the opening day — and projected the shadow as if there were no walls. it is a virtual shadow, but it is the actual sunpath, so you can see its movement. food service consultant: clevenger frable and lavallee, inc.
life safety: SLS consulting, inc.
security: security industry specialist, inc.